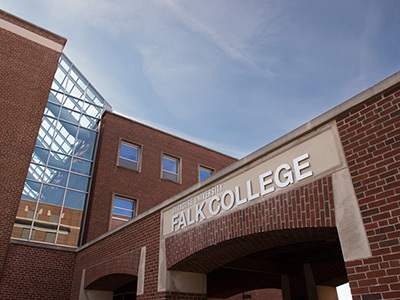 The new Falk College Office of Career Services will provide Falk students with personalized guidance and resources to help them achieve their post-graduation goals, start new careers or pursue graduate study. Services include one-on-one resume and cover letter consultation, interview coaching, job search strategy and negotiation preparation, digital presence and branding assistance, as well as skill-building guidance in professional communication and networking. Falk Career Services will also provide support to Falk alumni throughout their careers, and act as a liaison between Falk College and employers seeking to recruit Falk students, recent graduates or experienced alumni. Career Services staff, led by Associate Director David Sly, will work closely with Falk College’s internship coordinators to provide an integrated, four-year approach to preparing Falk students for success after graduation. All Falk College academic programs have professionally credentialed internship coordinators who form partnerships with businesses, government agencies and nonprofits both locally and around the world and connect students to internship opportunities that match their career interests. Falk College Career Services is made possible through the Invest Syracuse initiative, focused on advancing academic excellence and the student experience at Syracuse University. “Adding Career Services to the Office of Student Services in Falk College is an exciting opportunity for us to continue to support students in their academic and personal journey,” says James Byrne, assistant dean in the Falk College Office of Student Services. “We have the opportunity to get to know all of our first year students and have always explored students’ thoughts about their lives beyond Syracuse University. With the additional resources of Career Services, we can collaborate with the students in a more robust and structured manner from the time they arrive in Falk College through their commencement. Sly, who joined Falk College as the associate director of Career Services in September 2018, previously served in the University’s Institute for Veterans and Military Families as an advisor to veterans and family members, helping them to achieve academic, career and civilian transition goals. Before arriving at Syracuse University, he worked in alternative education from 2010-2015, which included leading vocational and outdoor experiential programs for at-risk secondary students that centered on self-discovery and building meaningful community connections. Sly, a veteran himself, served in the United States Army before beginning a career in education. “I am thrilled to be here at Falk, among students, faculty and staff that share a drive to build stronger communities through support to physical, emotional and social well-being; whether through policy, individualized care or sport. I am likewise eager to support Falk’s undeclared students, and assist them in discovering where their own values and skills align and illuminate a path ahead. In both cases, I look forward to providing career services that will prepare this diverse and deserving group for success after graduation, having personally observed the need that exists, both in Central New York and around the globe, for the meaningful service they can provide,” says Sly. Jessica Pitcher will serve as a career advisor. She most recently served in a case management role for a career program, serving young adults in the city of Syracuse who had been involved in the juvenile justice program. She is from the Syracuse area and familiar with the University. Pitcher previously worked in residence life as well as Summer College, and as a tutor and instructional assistant for student athletes. Contact Falk College Career Services at falkcareers@syr.edu or 315.443.3144, or visit Suite 300 MacNaughton Hall. More information is available on the Falk College website.